Ginny Kremer, a Southeastern Pennsylvania Red Cross volunteer caseworker and supervisor, was deployed to New York City on September 19th, 2001. Initially, she was at the Red Cross offices in Brooklyn, NY before being deployed to a shelter at Ground Zero. There, her job was to help individuals and families in the surrounding area who were displaced by the disaster. Her shelter provided food, clothing and financial assistance for people who were unable to get into their apartments. This is typical Red Cross casework but Ginny is careful to say that most 9/11 casework also involved emotional support. She tells the story of one gentleman who got past police barriers, eager to retrieve something in his apartment, found an airplane seat that had blown in through one of the windows and was traumatized. During her time spent at Ground Zero, she ate breakfast with other volunteers (Red Cross, firemen, and police officers) on a boat in the harbor maintained by the City of New York and the American Red Cross. She tells how all volunteers ate every morning in complete silence out of respect for the enormity of the loss despite a difficult time of trauma, uncertainty and bomb threats. One morning during the silence, a man stood up on a chair and began to sing, “Proud to be an American”. It was Lee Greenwood. He was among several celebrities who visited the boat to help lift the spirits of those who spent their days at Ground Zero. After four days, Ginny was sent uptown to the shelter at Pier 94 to work with the families of the deceased. There, she supervised a team of 32 volunteers who were providing comprehensive support for those who had lost loved ones in the attack. Red Cross casework usually involves a 15 minute interaction with a client to assess needs and find resources. Ginny reports that meetings with the families lasted much longer. First, there was the necessary acceptance that the loved one had passed, often without the benefit of physical remains. Then, there was the preparation of the death certificate and the provision of services such as food, shelter, financial assistance and funeral planning. But the meetings with the families never ended there; they often went on for hours as families shared memories, photographs, and worked through their grief and horror. Ginny Kremer (right) with SEPA volunteers Drew Alexander and Liz White. Liz also worked in New York as a Red Cross volunteer following the 9/11 attacks. Ginny still talks about her team with enormous pride. She says the Red Cross was careful to provide support to caseworkers. Team members looked out for one another, were honest when they needed a break and generous about giving others a few hours off. The Red Cross was careful to provide mental health support to volunteers and vet technicians brought in dogs for animal therapy. Ginny swears by a good long cuddle with a loving golden retriever. She says she met many wonderful volunteers from all over the country, but the people who stick in her head are the families. She became close to several of the families from the Pennsylvania area and has since returned to New York to attend memorial services with them. She says thousands of Red Cross volunteers were deployed all over New York City in the weeks after 9/11 and the organization was stretched thin. She herself spent three weeks in the City and then came home for two weeks before returning again to relieve the burden on others. She remembers being exhausted but also honored to help. She remembers hundreds of Red Cross shelters where ordinary New Yorkers could get free coffee and donuts. She remembers hearing bagpipes every day, all over the city, as New York began to honor its dead. As a long time Red Cross volunteer, she is proud to have been of service. 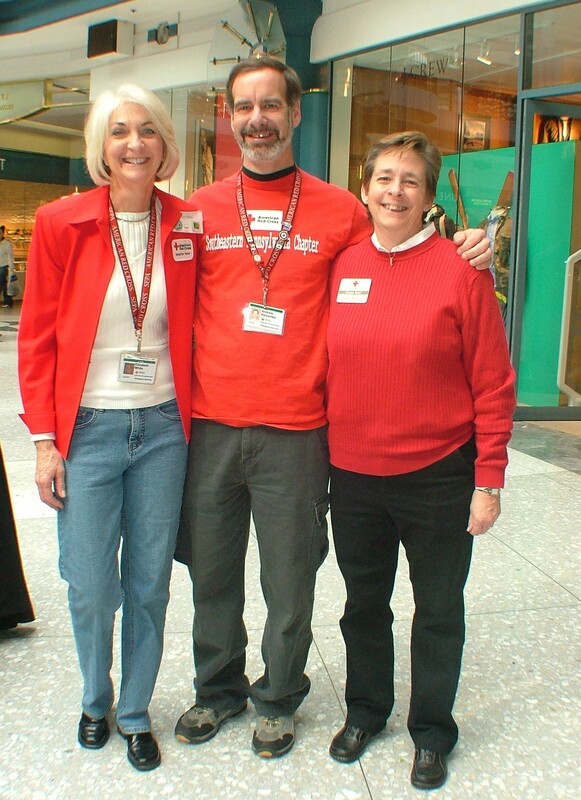 is a longtime volunteer with the American Red Cross of Southeastern Pennsylvania. This blog is written by Sarah Peterson, another volunteer who spoke with Ginny about her experience volunteering at Ground Zero in the days, weeks and months following the 9/11 attacks.